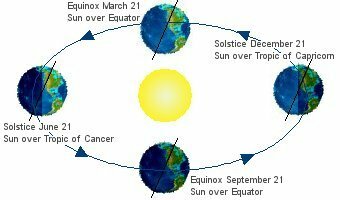 In the United States and the rest of the northern hemisphere, the first day of the winter season is the day of the year when the Sun is farthest south (on December 21st or 22nd). This day is known as the Winter Solstice. The day of the winter solstice is the shortest day of the year. The length of time elapsed between sunrise and sunset on this day is a minimum for the year. In the United States, there are only about 9½ hours of daylight on this day. At latitude 40 degrees north, the earliest sunset of the year occurs around December 8, and latest sunrise occurs around January 5. The day with the least amount of daylight (the first day of winter), occurs around December 21. Why are all these dates not the same? For a detailed explanation, see The Dark Days of Winter at the U.S. Naval Observatory web site.